A lot of my photography is studio based lightpainting work, and that involves working remotely from the camera with the studio lights out. 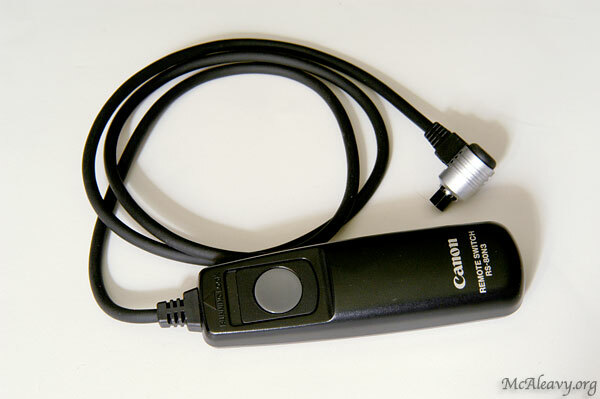 This makes using a conventional cable release difficult, as it involves finding the camera twice in the dark, first to open, and then to close the shutter. 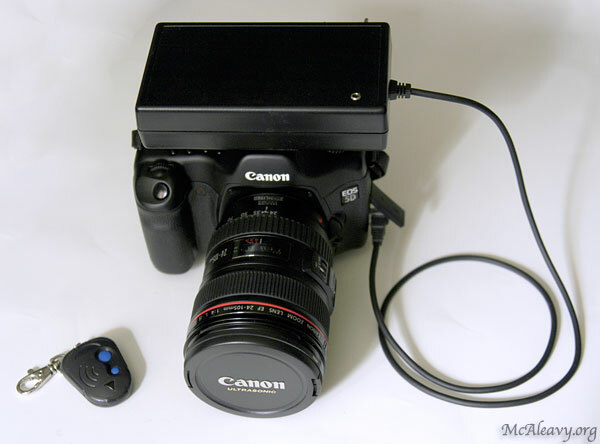 What I needed was a wireless shutter release, so, as nothing one the market did exactly what I needed, I built one myself. This ended up being cheaper than the available commercial alternatives, and does a few crucial things that they don’t. It works when there is no line of sight between me and the camera, it has a much greater range than infrared based units, and it allows me to latch the shutter open with one press, and then close it with a second. WARNING: Wiring external circuits up to your (probably very expensive) camera should only be attempted if you’re confident that you know what you’re doing. 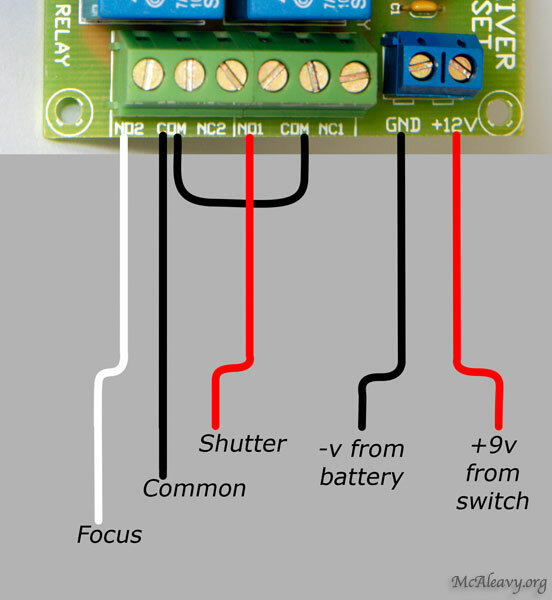 This circuit uses relays to isolate the camera, but you’re still making an electrical connection, so if you mess up you could damage it. 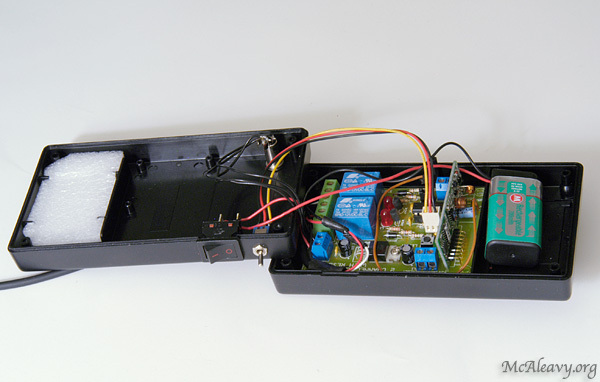 The unit is built into a small ABS plastic box of the type that has a 9v battery compartment at one end. I attached a flash hot-shoe (salvage from a hot-shoe adapter) to the bottom of the case to allow it to be fixed to the camera as taping it to a tripod leg was proving inconvenient. Click the images to expand. As my electronics knowledge isn’t sufficient to allow me to build something like this from scratch I went looking for a pre-built module to handle the radio side of things, and found this one. It has 2 channels, allowing one for focus and one for the shutter release, and comes with a two-button key-fob remote. It really requires 12v, but only for the relays, so will run happily from a 9v battery until the voltage drops too low for them. They could be changed for 9v equivalents, but as I’m using a rechargeable battery, I just swap it when that happens. To connect it up to the camera I used the cable from my Canon RS-80N3 cable release. My intention was to add a socket to it so that I could plug a cable into it from the radio release, but the screw heads stripped when I tried to take them out and I had to drill them out to get it apart. I don’t have a photograph of the inside of the thing, but all it contains is 2 simple switches. No fancy electronics for all that money, which might be a bit of a shock, but makes it easy to trigger the camera with something else – all you need is a couple of switches (or relays). Different cameras will have different wiring schemes, so you may need to do some research to find out how yours is set up. The cable can then be attached to the box using the existing grommet. You’ll probably have to extend the existing wires a little to make them reach. 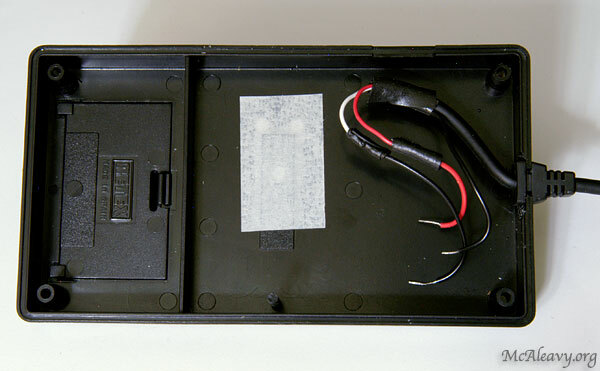 The board can then be placed in the box and the wires attached to the screw-terminals. The connections are straightforward. The board has 2 channels, labeled NO1 and NO2, which will be used for shutter and focus respectively. 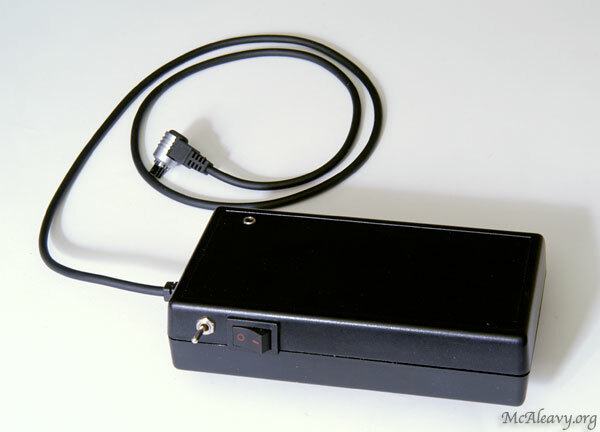 Attach the common wire (the screen in the RS-80N3 cable, shown black here) from the remote cable to one of the COMM terminals and connect that with a jumper wire to the other COMM terminal. Then connect the shutter wire (red) to NO1 and the focus wire (white) to NO2. With this arrangement the small button on the key-fob remote will activate the camera’s focus and the large button will trip the shutter. 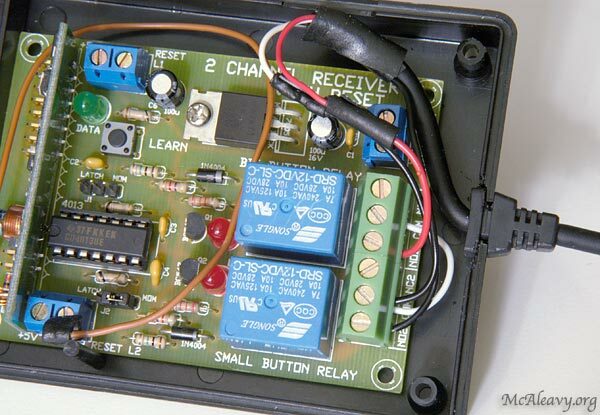 For power, attach the negative wire from the battery to the GND terminal and the positive wire to the +12v terminal via a SPST switch. The switches can then be attached to the top half of the box. 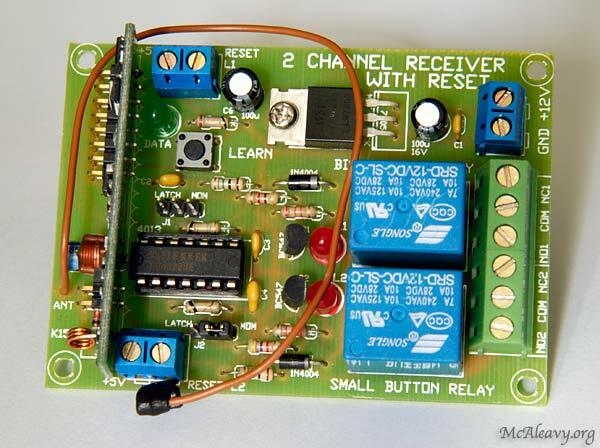 The board has two jumpers that allow each channel to be changed from instant to latching. On the shutter channel (NO1) I removed the jumper and added a SPDT switch so that I could use it either as a normal release (instant), or to hold the shutter open until a 2nd press of the button (latching). I used the connector from an old PC case fan as it was just the right size to fit the 3-pin header on the board. I also added a 3.5mm jack socket and wired it to NO1 and NO2 in parallel with the Canon cable to allow the unit to be used with cameras that don’t use the Canon connector. 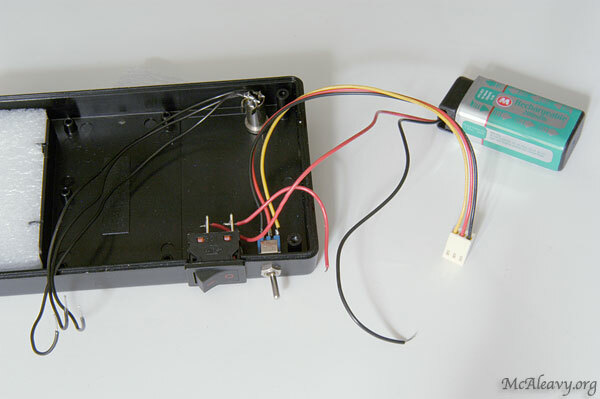 The two halves of the case can then be wired together, and the unit tested. I used a small piece of foam to stop the battery rattling around and another to hold the board in place as I didn’t have anything else to hand to mount it. The completed unit. Even with it’s internal aerial the range is sufficient to allow the shutter to be tripped from far enough away that the sound of it tripping is inaudible. A desirable modification is therefore to add an LED to the case that illuminates when the shutter is open. I’ll get around to that eventually.